8-day movement with half hour striking on a gong, finely made patinated bronze case. 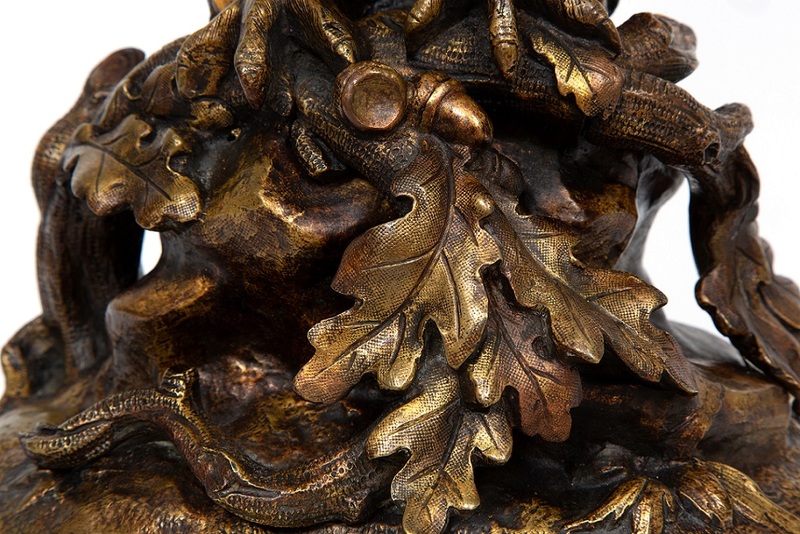 The finely cast and chiseled patinated bronze case is shaped as an owl on a branch with oak leaves. Both the dial and the back door are integrated in the design. 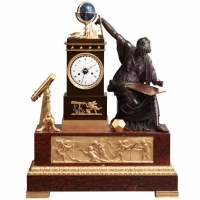 The whole is placed on an oval base with a brass moulded rim. 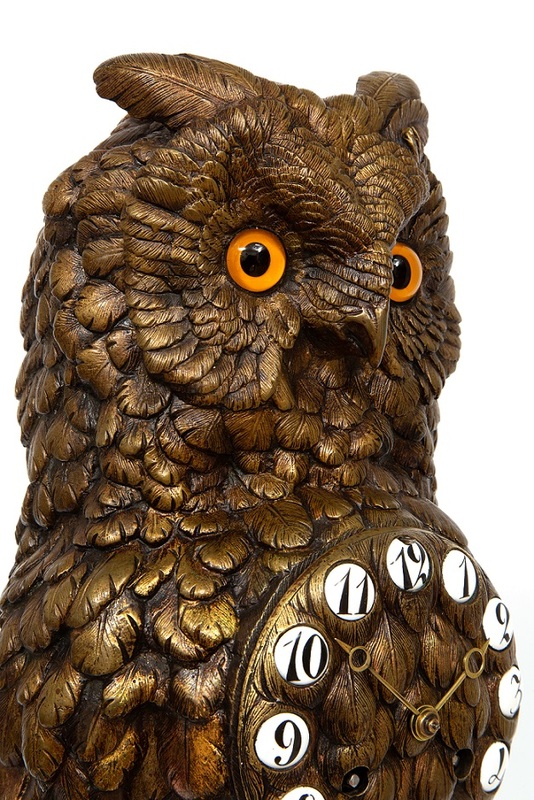 Integrated and fitted in the belly of the owl is the dial which has round cartouche enamel Arabic numerals. The brass hands are of the Breguet type. The movement is driven by spring barrels and has a duration of eight days. It strikes the hours and half hours on a gong which is a spiraled steel bar. The movement is regulated by a Brocot anchor escapement. It is marked on the back plate E.P. depose. Looking at our website one sees that there is great diversity among antique clocks. 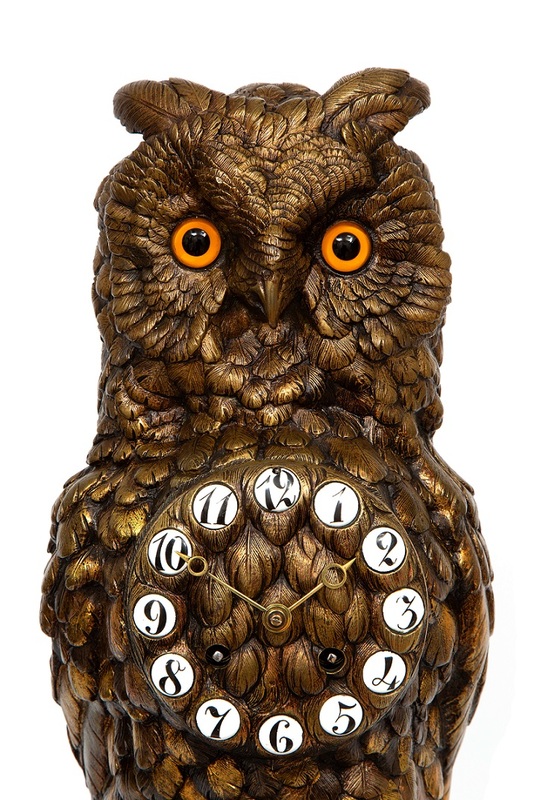 There is also great diversity in what makes a certain clock interesting or desirable. 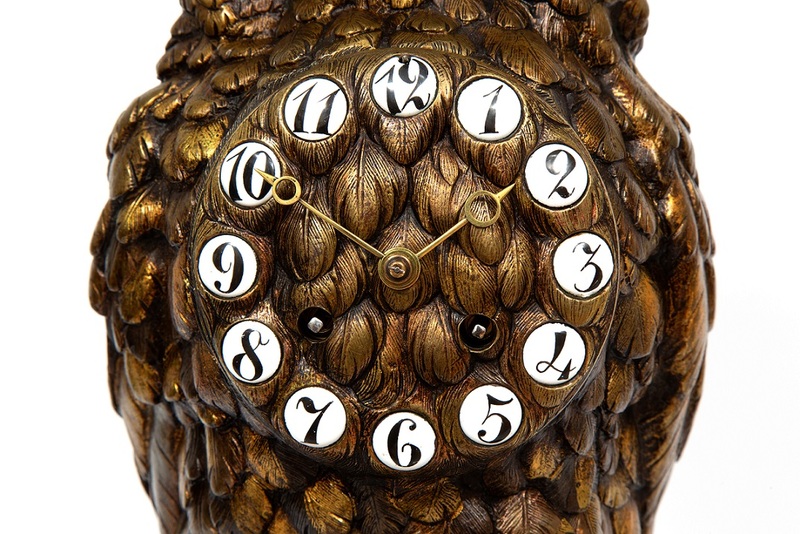 It might be something technical in the movement that is complicated or rare, or it might be the provenance surrounding the clock, a historical story. Sometimes craftsmanship or just beauty is the attraction. 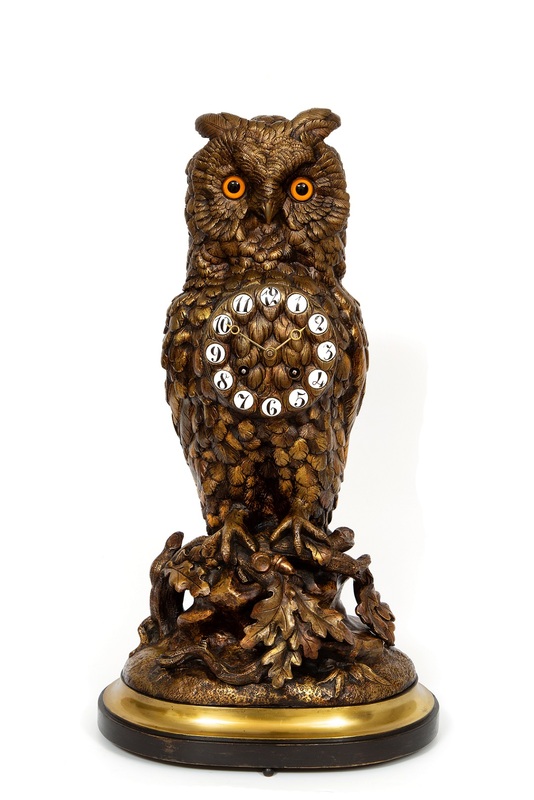 Of course, there are clocks with extra features such as automatons or musical mechanisms that make them sought after. 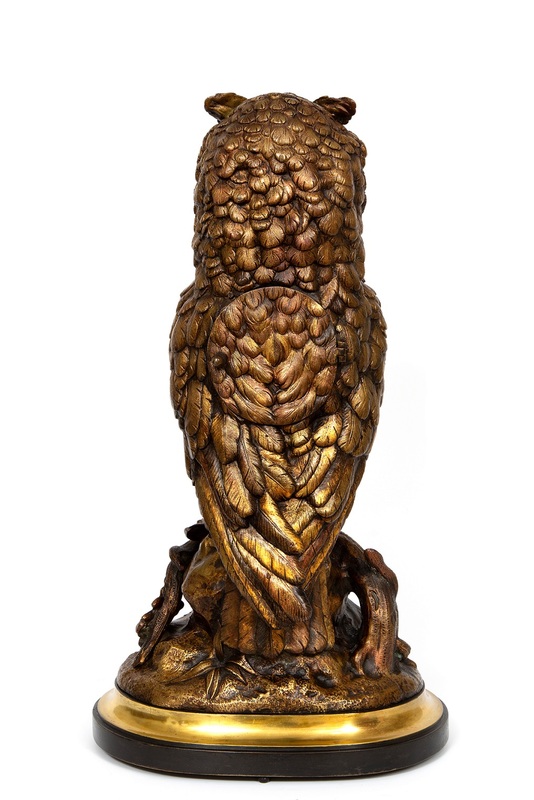 But with this well-cast and chiselled bronze owl it was something hard to explain. 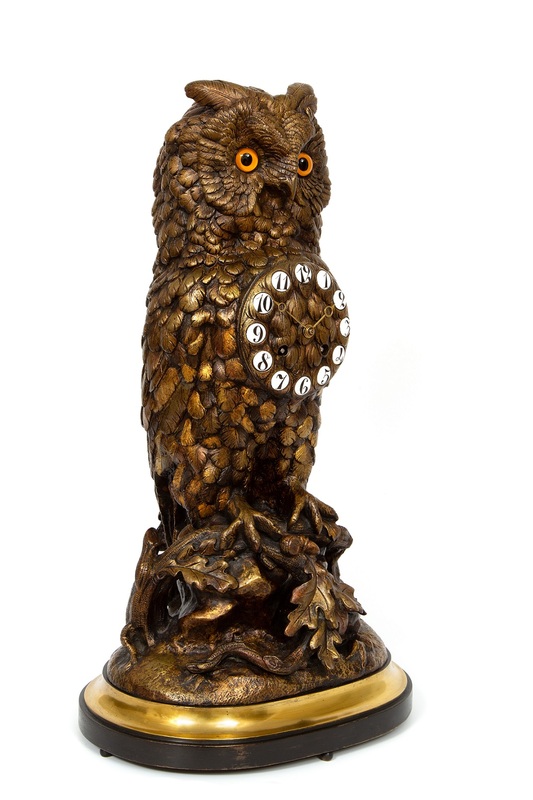 It just seems to gaze in a particular way that almost makes a connection with the beholder. It just makes one stand still and look. And, from experience, I know that this is a lasting quality.